DSP&P's 23 coaches came from several sources across the first ten years of the railway's life. 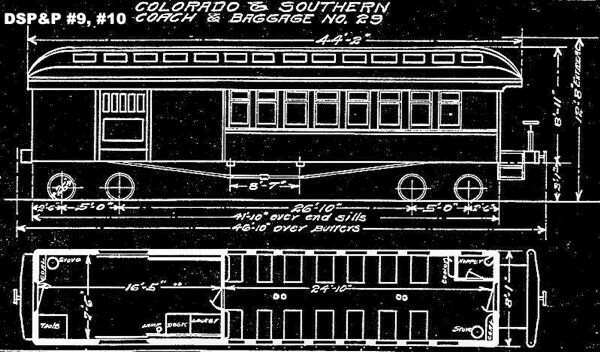 They ranged from 34 to 42 feet in length and most lasted well into the C&S era, with some rebuilds along the way. The variety of the window treatments are the most distinguishing characteristic of these cars. Roof lines varied but became uniformly bullnose style sometime after delivery. There are no accurate models of these cars in any scale that I am aware of. That's a sad commentary on those manufacturers who have concentrated so much effort on D&RGW passenger equipment. 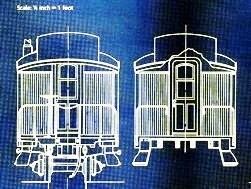 Sources: Mid-Continent Railway Museum website. 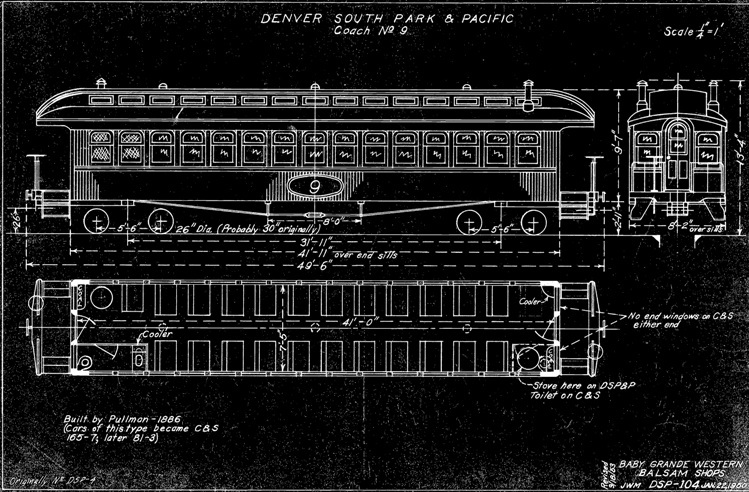 The first coach, DSP&P #2 "Denver" arrived in 1874 along with DSP&P #1 "Auraria", a combine. 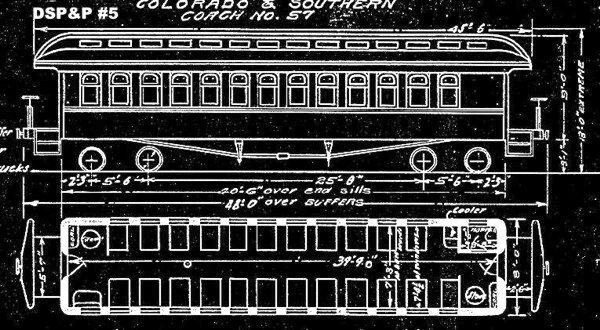 There are no photos of these in their early years, but combine #1 survived into the C&S era and a folio drawing shows it to be 34' 9" feet over the body end sills. There were 12 windows to a side with 11 rows of seats, probably 2+1 configuration. 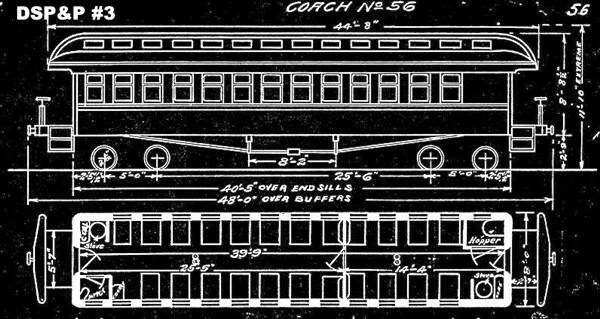 Coaches 3, 4, and 5 were built in 1878 by Barney and Smith. #4 was reported to be a combine but was a coach by 1885. 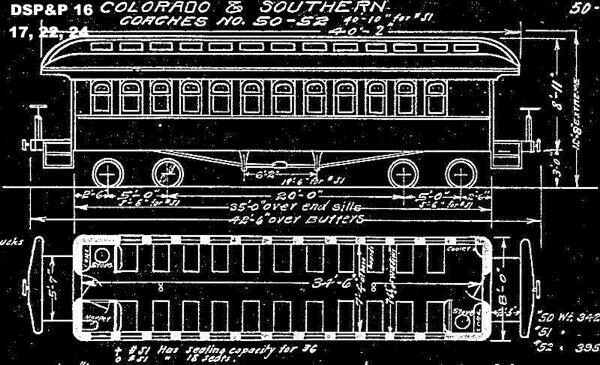 They were named "Geneva", "Halls Valley", and "Leadville", and were 40 feet over the end sills. These cars had 14 windows with 2+2 seating. 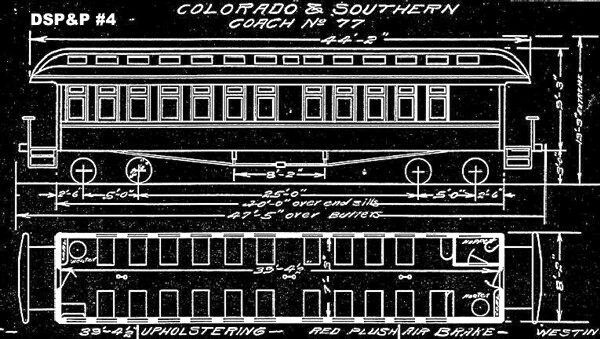 DSP&P #7 "Como" had 15 windows and 2+2 seating. Built by the DSP&P in 1879. It was converted to a combine in the C&S era. 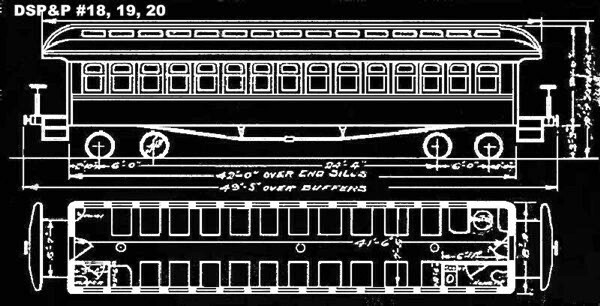 Cars #9 and 10 were built by the DSP&P shops in 1880 and had similar window layout. These were 42 foot cars while #7 was 40 feet over the body. Both were rebuilt into combines by the DL&G in 1892. DSP&P #11 through 15 and 2nd #2 were short 35 footers obtained from the New York Elevated Railway. 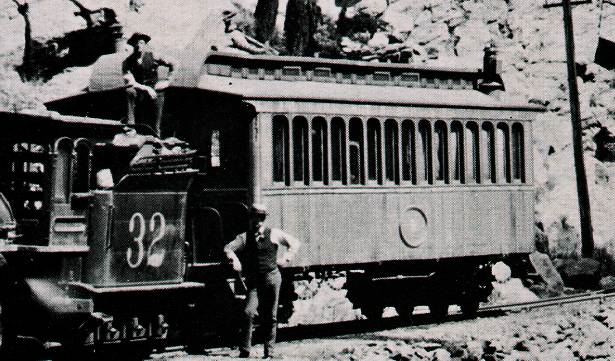 Built by Gilbert, Bush around 1876, they were 8' 10" wide, had center doors as well as end platforms, and were about half the weight of a normal NG car. 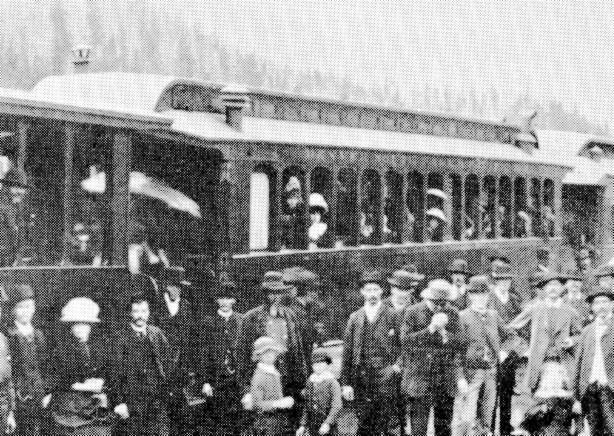 They didn't last long and all were assigned as outfit cars by 1885 and gone by 1889. There are no photos or plans of these cars. 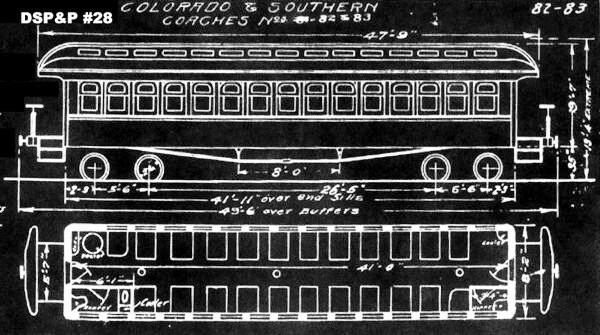 Coaches 16, 17, and 22 through 25 were purchased from ATSF in 1880. #23 and 25 were immediately converted to combines. Originally built in 1879 by Bowers Dure, they had 13 small windows and were only 35 feet over the body end sills. 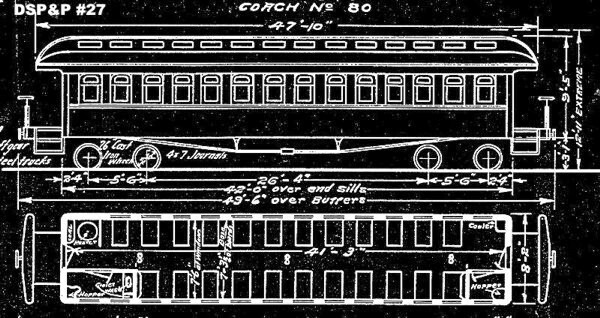 Coaches #18 through 21 were 1880 Pullman products, 42 feet over end sills, with 15 windows and large observation windows on both end walls. These were sheathed over by 1885. Baggage-RPO cars #43 and 44 were part of the same order from Pullman. DSP&P #27 and 28 came from Pullman in 1884. #27 had 14 windows and #28 had 15, but both were 42 feet over end sills. DSP&P #5 "Leadville", a Bachmann kit with custom paint and lettering, and DSP&P #16, an LGB model with a black roof and number plaque, as they appear on the author's large scale outdoor railway. Both cars are short by a couple of windows. DSP&P #3 "Geneva" after 1885, renumbered as #63. DSP&P #4 "Halls Valley" as a coach after 1885, renumbered as #64. 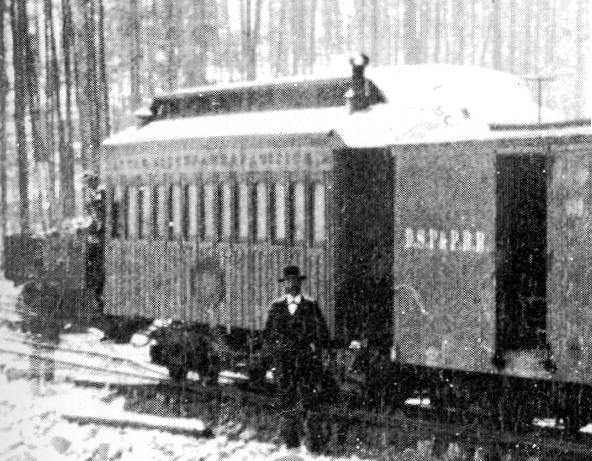 DSP&P #5 "Leadville" after 1885, renumbered as #65 (left) with #64 at the right. DSP&P #7 "Como" after 1885, renumbered as #56. DSP&P #9 well before 1885; later it became #57. DSP&P #10, after renumbering to #58. DSP&P #16 around 1880, one of six purchased from AT&SF; note white letterboard and dark lettering, and fancy paneling below windows. Probably DSP&P #24 about the same time. Cars 17 and 22 would look the same as these two cars. #23 and 26 were converted to combines before being placed in service. 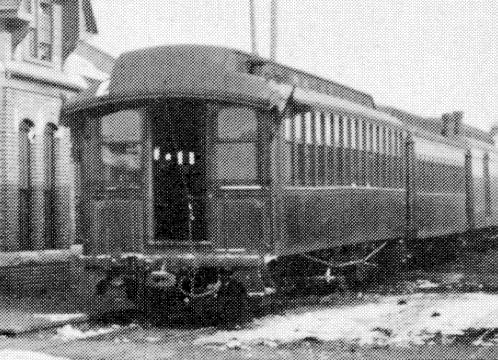 One of DSP&P's Pullman coaches #18 -- 21; note large observation windows (on both ends) and fancy paneling below windows. DSP&P #27 after 1885, renumbered as #70 (left). Other car is CC #11 or 12. This plan by John Maxwell shows DSP&P #9 as delivered with large number plaque. 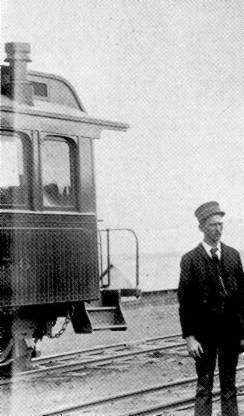 He notes that the car was built by Pullman in 1886; other sources say 1879 at DSP&P shops, but possibly from a Pullman kit. 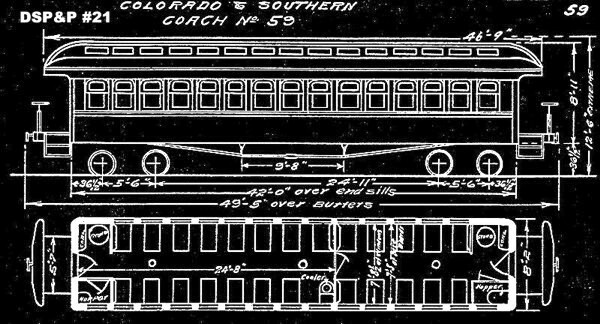 These two plans Show DSP&P #3 "Geneva" and the Bowers, Dure cars acquired from the AT&SF as they appeared on the C&S after 1899. The folios below are from around 1906, so some allowance must be made for rebuilds and windows sheathed over adjacent to stoves and toilets. 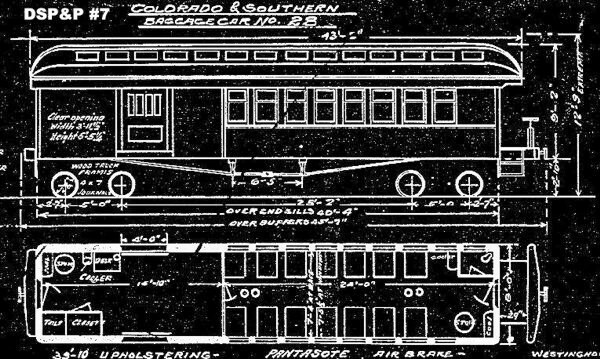 Compare the folio below of DSP&P #3 with the plan of the same car shown above.